As a byproduct of attending the Tasting Menu event at Milestones awhile a back, we received $50.00 in gift cards. 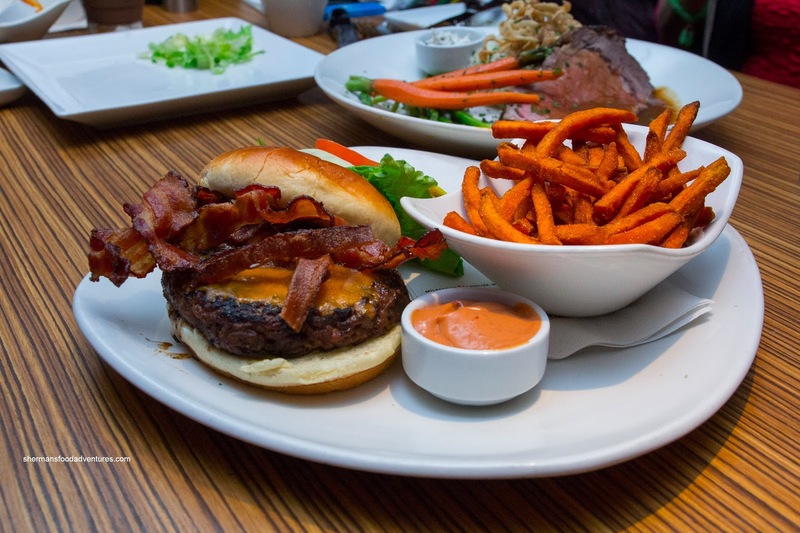 Hence, we figured it would be a good idea to pay a revisit to sample their new menu items as well as some classics. 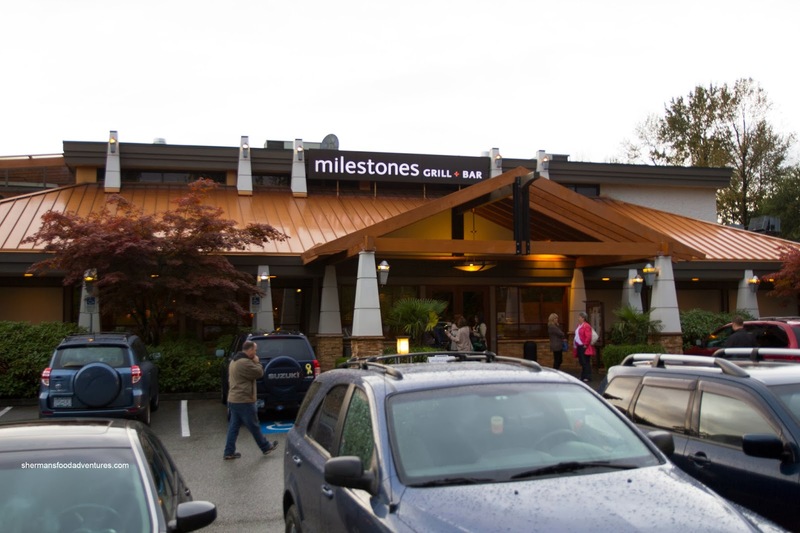 If there was ever a good example as to why chain restaurants do well in the GVRD, look no further than the Coquitlam location of Milestones. The place was already packed at 5:30pm and we had to wait for almost 45 minutes for a table. We started with the Phyllo Shrimp, much to the delight of my son. By employing the crumbled phyllo as a batter, there was this "panko-like" effect going on. Hence, the exterior was really crunchy, yet light at the same time. They could've done a better job draining the oil as the bottom was quite greasy. Inside, the shrimp was cooked just right exhibiting a buttery snap. At first, I was concerned with the side of sweet chili sauce as it brought up memories of the bottled stuff, but it was actually good with a nice balance of sweet, tart and spicy. 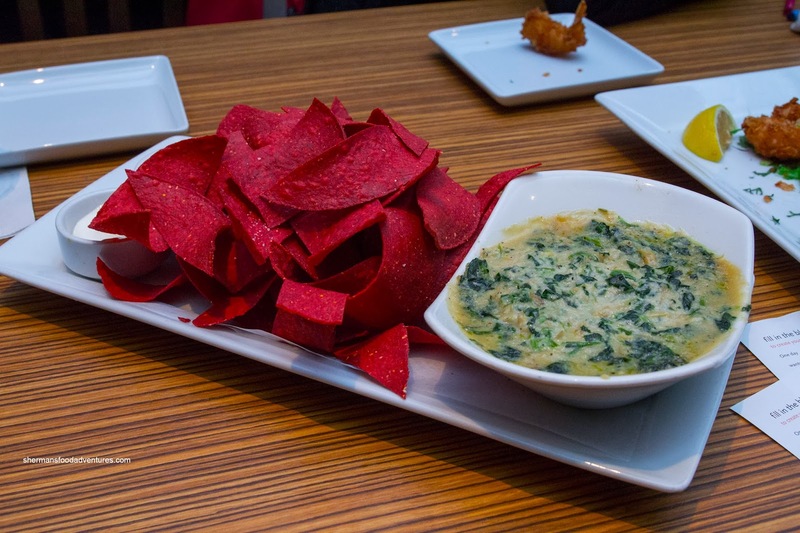 As much as the Spinach & Artichoke Dip has been on the Milestones menu for 20+ years, it holds a special place in our hearts. And really, it is not all about nostalgia either as it still stacks up to the best of them. Creamy, cheesy and full of spinach with some artichoke, the dip was exactly how we remembered. We like how it is not too dependent on mayo or the dreaded cream cheese. The house-fried tortilla chips weren't bad either. 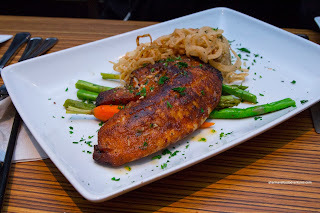 Viv decided to order one of their new menu items being the Chili-Crusted Tilapia. I was a bit nervous since tilapia can be mushy and unappealing if prepared incorrectly. And it can still be awful even if prepared correctly... Surprisingly, they could not have done a better job as it was moist, flaky and relatively firm. The exterior rub was spicy and flavourful. We liked how it was a relatively large portion as well. 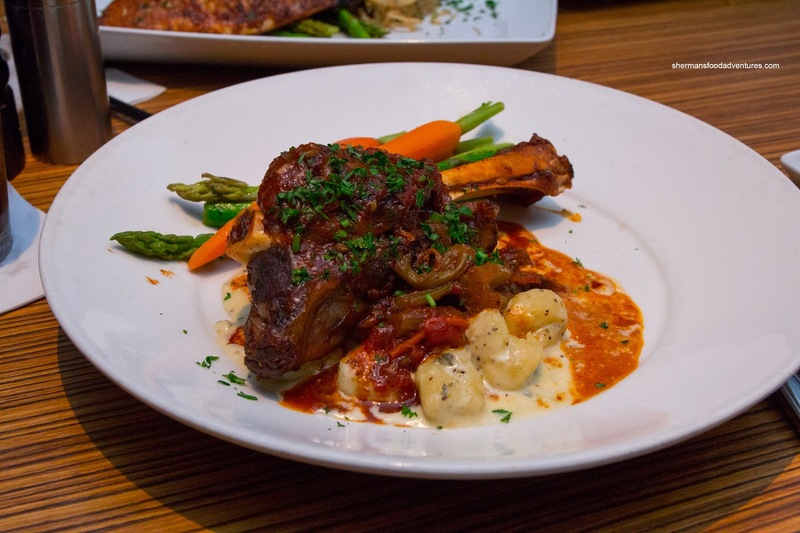 For myself, I decided on the Lamb Shank and it was mostly fatty, tender and gelatinous. Some parts were more firm, yet it wasn't hard to eat. I found the braising liquid to be on the saltier side and with the addition of the creamy (and aggressively seasoned) gnocchi, there was too much salt. I found the gnocchi a bit too starchy and soft when it was squashed by the lamb shank. Otherwise, it was an acceptable dish. My daughter had the kids' Grilled Salmon and it was grilled beautifully with an attractive cris cross char. The meat was moist and just cooked. It was a decent portion for the price ($8.95 including choice of beverage and dessert). As much as my daughter enjoyed the plain jasmine rice, it seemed to be begging for some sort of sauce. But then again, what do I know? I guess kids like plain rice. My son decided on the Mini-Burgers with curly fries. Nothing particularly interesting nor wrong with this dish. He ate them with little fanfare. Probably just the luck of the draw, he got more little pieces of fries rather than actually curly ones. 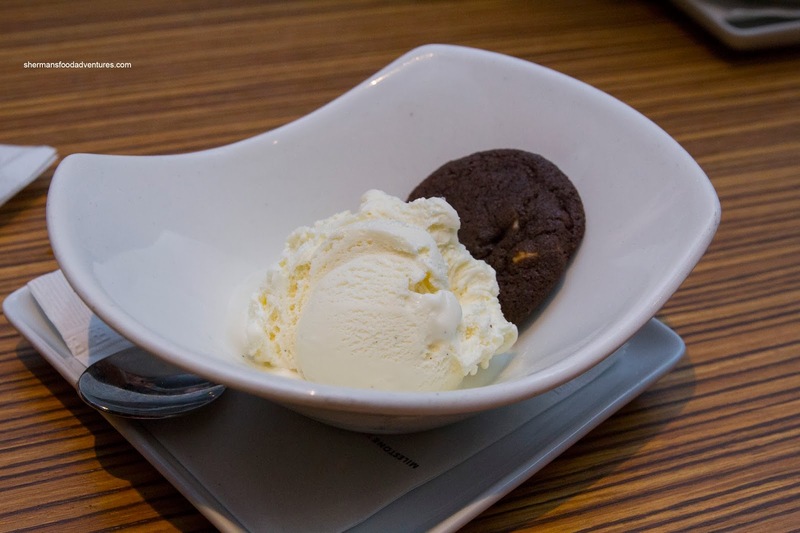 For dessert, they were served a scoop of vanilla Gelato and Chocolate Cookie. Again, nothing out of the ordinary, it did the job. 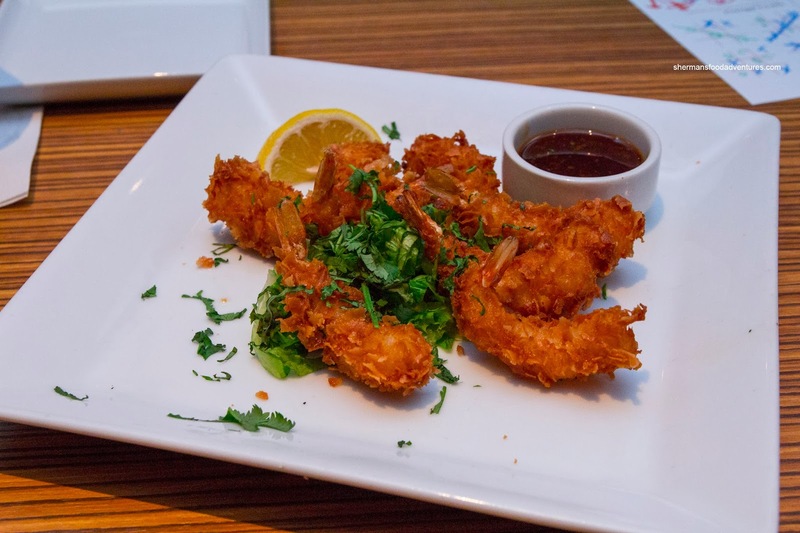 Seeing how we only sampled a small selection of dishes, we returned a few weeks later with my parents to round out this post. We started with the artichoke dip again and in addition, tried a new appie being the Chorizo Mozzarella Fritters. 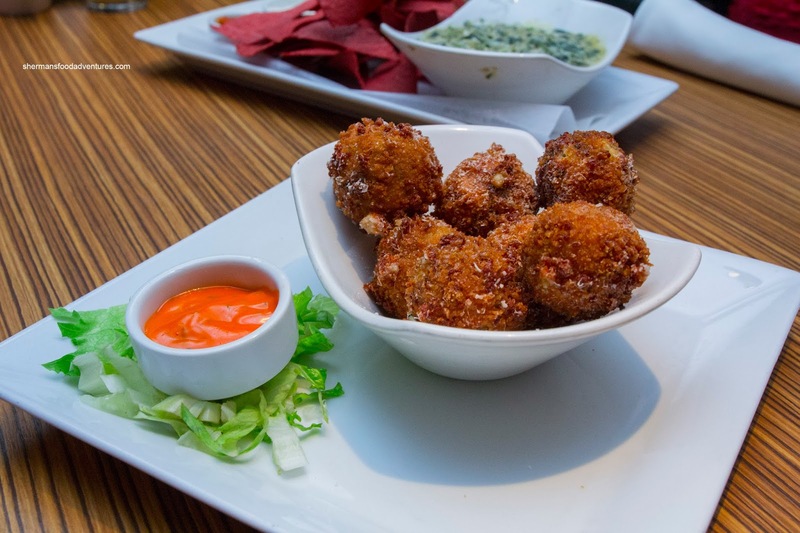 These crunchy panko-coated balls of joy were filled with stringy mozzarella, chorizo, garlic and parsley. I found them to be pleasing, yet heavy as an appie. Despite not reading the actual description of the dish, it was pretty apparent that the aioli was smoky paprika as the flavour was strong and unmistakable. My daughter had the same kids' meal while my son chose the Chicken Fingers and Fries this time around. These were very crunchy with a thick breading which helped keep the juices inside. 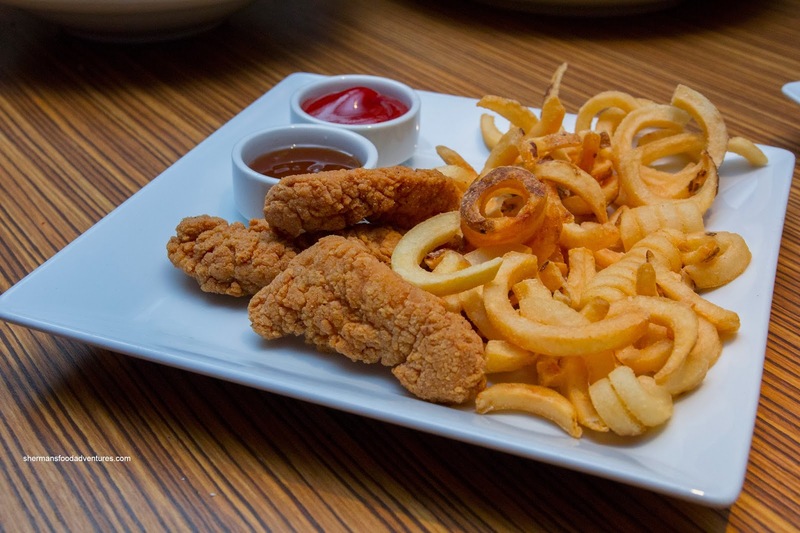 Unlike last time, there were actually curly fries on the plate. I thought they could've been crispier. For myself, I had the American Burger with aged cheddar and double-smoked crispy bacon. 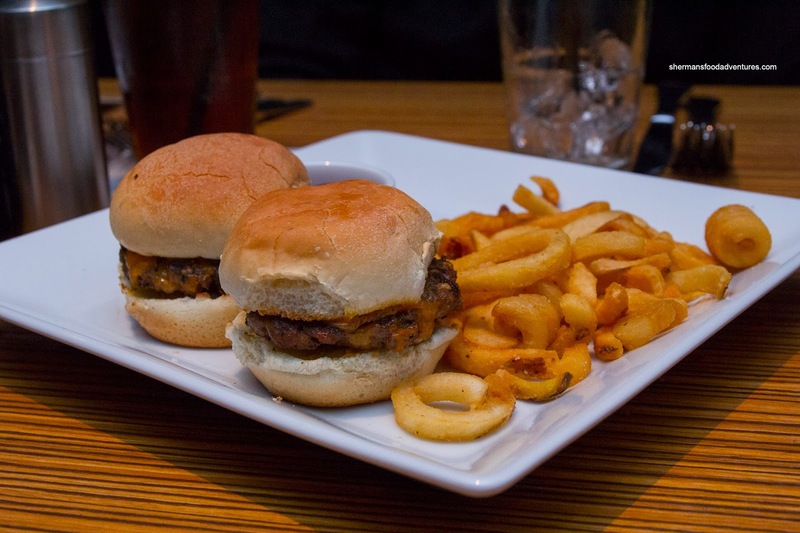 Unlike the many times in the past, the burger patty was dry and dense. It was meaty tasting though while being well-seasoned. Adding to the dense patty was the relatively heavy bun. I did like the side of Yam Frites though as they were really crispy and surprisingly airy. They stayed crispy to the very end which was impressive as most yam fries start to soften as time passes. The accompanying chipotle aioli was slightly spicy with a nice zip. 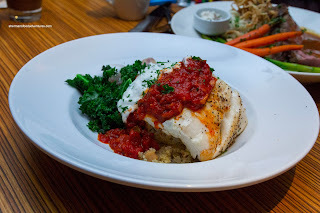 Viv actually ordered the 3-course meal from the seasonal menu for $40.00 (which included the fritters) and chose the Halibut with Smoked Tomato Sugo as her main. Although the substantial piece of halibut was fresh, it was slightly overcooked. But that was nowhere near the doneness of the quinoa underneath. It was totally destroyed being a complete mush and underseasoned. The smoky tomato sauce was a tad too spicy where it overwhelmed the fish. On the other hand, when combined with the rest of the ingredients, it was less so. My parents went for the classics with the Portobello Mushroom Chicken and Slow-Roasted AAA Prime Rib (Small Cut). 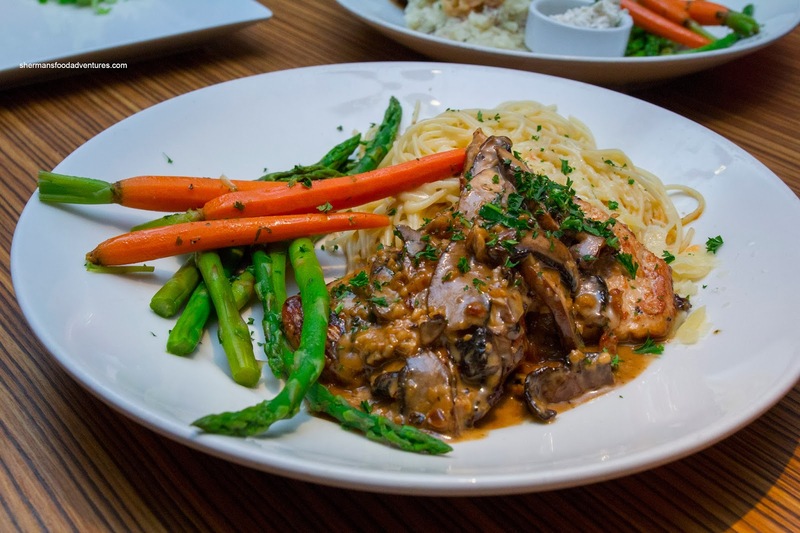 As much as the mushroom chicken has been on the menu forever, it was still exactly how we remembered it. With a rich, creamy and garlicky sauce, it was a nice compliment to the relatively al dente capellini. The chicken breasts were a touch overdone, but still not incredibly dry either. 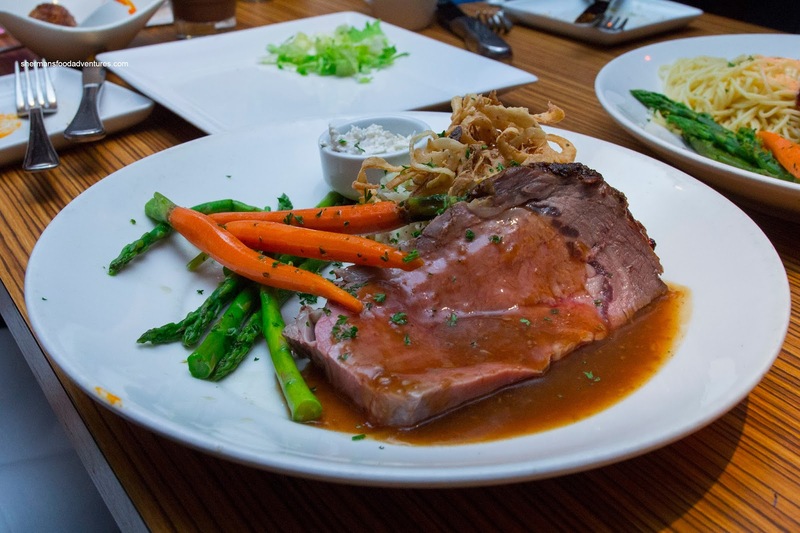 The prime rib was a proper medium rare and tender as per usual. It came with all the fixins including mashed potatoes (potatoey with chunks) topped with crispy onions and vibrant veggies. No one saved room for dessert except for Viv and the kids. The kids had their gelato again while Viv had her 3rd course being the Carrot Cake featuring 3-layers doused with cream cheese icing and a side of citrus slaw. Personally, I found it moist with a nice hit of nutmeg. However, the whole thing was far too sweet for my tastes. So after the 2 visits and a wide selection of new dishes and old classics, it appears Milestone's is still using a relatively tried and true formula with a few new bolder dishes. 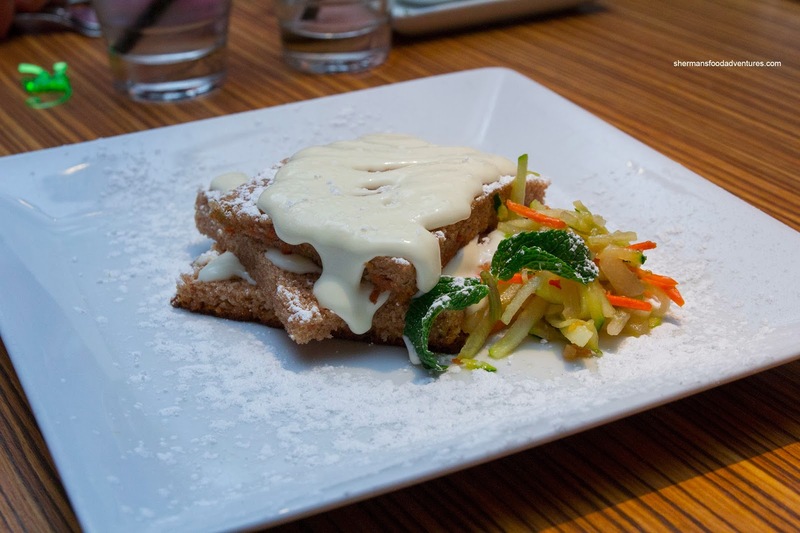 Hence, the old stuff is quite predictable while the new dishes can be a little hit and miss. 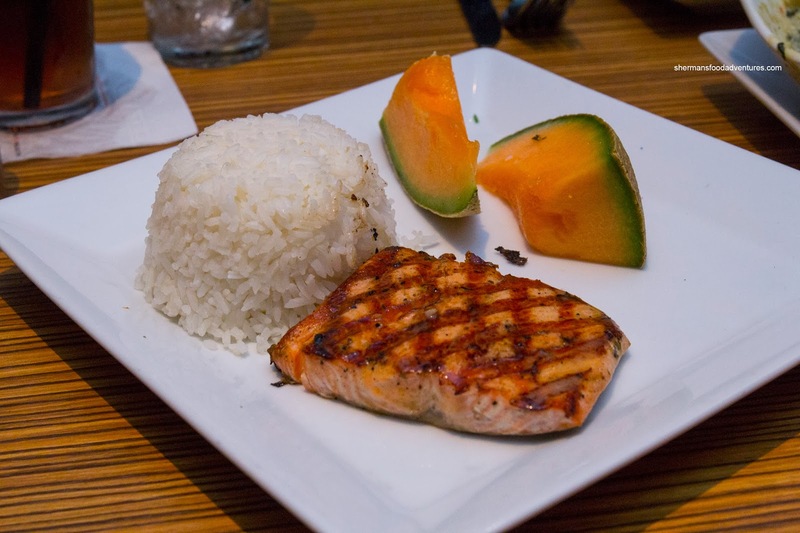 Portions are still good, but the prices tread dangerously into fine dining territory.